On the second day of arrivals into China’s Sailing City, PSP Logistics was the first to arrive in and join and receive its famously warm welcome from the hospitable Host City. PSP Logistics’ sixth place finish is its best result yet in the 2015-16 series, bettering its previous best eighth place in the race into Cape Town. Clearly pleased with his team's improved performance, Skipper Max Stunell says: “Well that had a bit of everything! This leg in all has been quite the challenge. Since starting off in Australia in very hot, sweltering conditions, there was a lot of shipping and fishing fleets to contend with, and then recently it got bitterly cold. It has been painful being on deck for more than half an hour in the past week or so. Definitely the coldest we have experienced so far. “The crew has done really well and we’re all really pleased with our result. Everyone pulled together and worked really hard in the tough times and it has finally paid off as we hoped! We have been practicing hard and trying to keep our boat in good shape. As we go further in this journey, the crew have become much better at sail changes without damaging anything which really paid off in the storm and made a real difference, and then it is also down to a lot of pure grit and determination. On arrival to the pontoon, round the world crew member Henrik Schonfeld, 22, from Munich, Germany says: “It was great. That was two intense weeks I think with everything from no wind at all to about 60 knot storm force gusts. I think as a crew we all pulled together and dealt with the challenges very well. “We thought we might even have been able to catch up with GREAT Britain at the end there and get fifth place but that was just out of our reach in the end, but we’re all really pleased with our sixth place finish now and we don’t have many damages on the boat so that’s also really good. I think we have been waiting for our first good result but we always knew that it would come eventually. We’re a very happy and safe boat which is the most important thing for us at the end of the day. 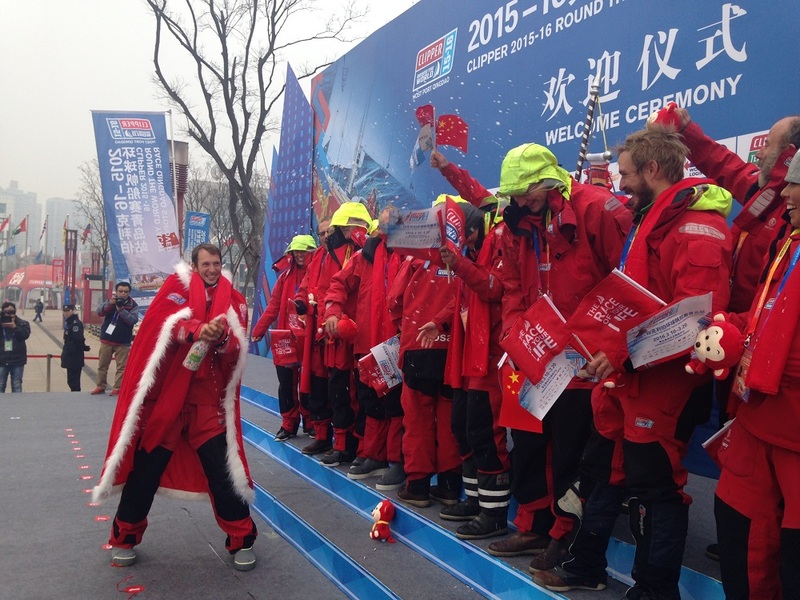 The team then took to the stage, where Skipper Max was presented with his cloak which symbolises the ancient Chinese legends of returning warriors, and the crew received their commemorative red scarves and monkeys, the animal which represents the 2016 Chinese New Year. 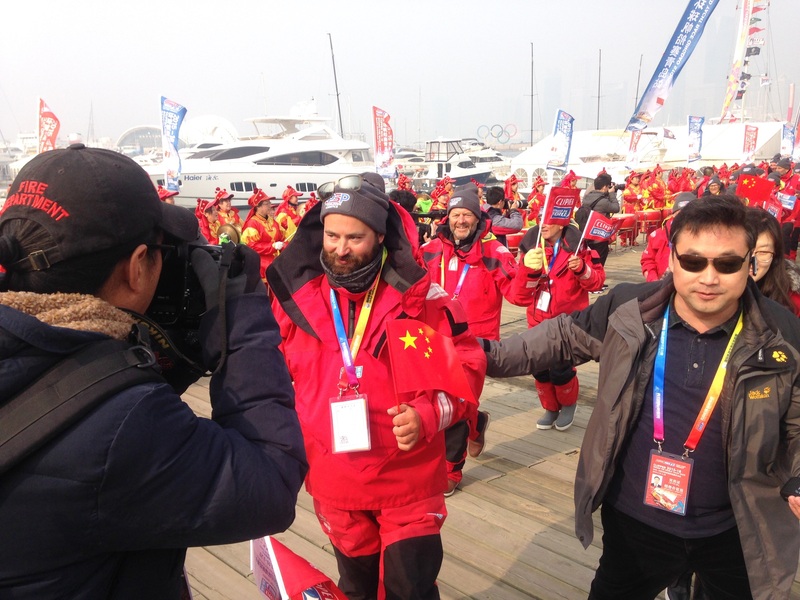 The next team to arrive in was seventh placed Qingdao, which received a heroes welcome into their home port as hundreds of media and supporters gathered at the marina to greet them. 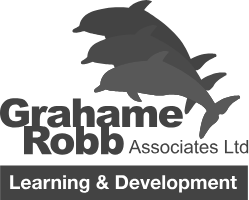 To read what Skipper Bob Beggs and his crew made of the experience, click here. The first of the afternoon arrivals was Da Nang - Viet Nam led by Skipper Wendo Tuck. 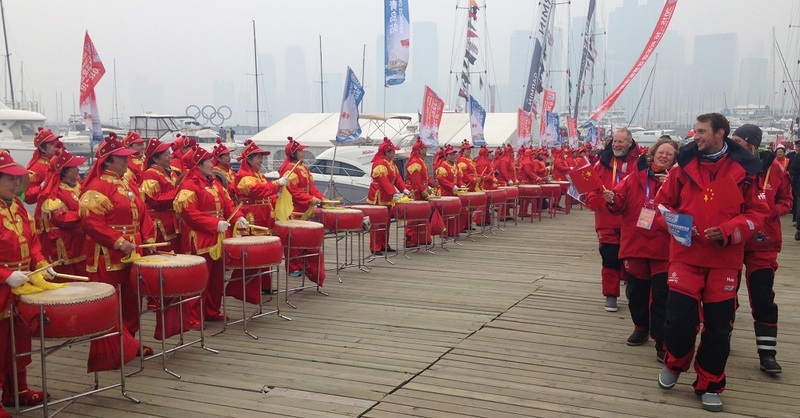 The team left behind their home port at the start of The Sailing City • Qingdao Cup so the arrival into China was reminiscent of what they had experienced a few weeks ago themselves. "This welcome is incredible! Even before getting off the boat we could see where we had to walk through the crowds so I got my camera ready to play tourist. It looks and sounds amazing. When you are greeted like this in port it just makes you forget all about the bad times and you think this is so worth it!" As has been well documented by all the teams, the storm that hit in the Yellow Sea earlier in the week produced some difficulties for Da Nang - Viet Nam in terms of the sail damage sustained, as Skipper Wendo recalls: "It was a tough leg. We were all set up for the front that was coming through, we had a couple of reefs in and the right sails up but it just kept building and building. So we got the Yankee down and as we went to put our third reef in the top slider of our mainsail came off which meant that we couldn't use our mainsail and had to drop it in 60 knots. That sucked. "Next up is the Pacific Ocean crossing and it's going to be a toughie but we are up for the challenge!" The next team arrival was ninth place Visit Seattle. With the team in high spirits as ever as they enjoyed their ceremonial welcome, Skipper Huw told us: "That was fantastic. Dare I say the best yet?? I don’t know! It’s such a stark contrast from just bashing your way upwind for what feels like forever to get here. Also I love my cloak! They say I have to wear it all week and I say, let them try and stop me! "This race was everything. A very strong start, a frustrating middle bit, but that’s the way it was, and then we spent the last two days trying to catch up. Plus we had a phenomenal storm, absolutely unbelievable, so we went through that but we came out of it smiling. We’re all looking forward to arriving into our home port now. Very exciting. It is almost finally our turn to go home!" Tenth place IchorCoal just became the final team to arrive today, sneaking into port within the strict daylight arrival rule that exists here. Ahead of the arrival ceremony, Skipper Darren Ladd says: "This race was going pretty well until the last few days when that massive storm hit just outside of Shanghai. It took us at full force and knocked us back for about 18 hours but since then we had a good run up picked back up and we then had everything from hurricane force winds to nearly nothing. But the last twelve hours, the winds were perfect and we made it here just in time which is brilliant as we wanted to celebrate Rob Davis' birthday today, and now we also get to see the rugby tonight!" "This has been a really really hard, really cold leg, and all the crew have got up there and done it. It feels superb to be here now though. We're all really relieved. This is my first time in China. All I know is I like the food and I’ve enjoyed the welcome here, so so far so good!" IchorCoal crew member Rob Davis, who joined the race in Cape Town, is celebrating his 47th birthday today. On stage he was presented with a welcome beer and the city officials wished him a Happy Birthday. 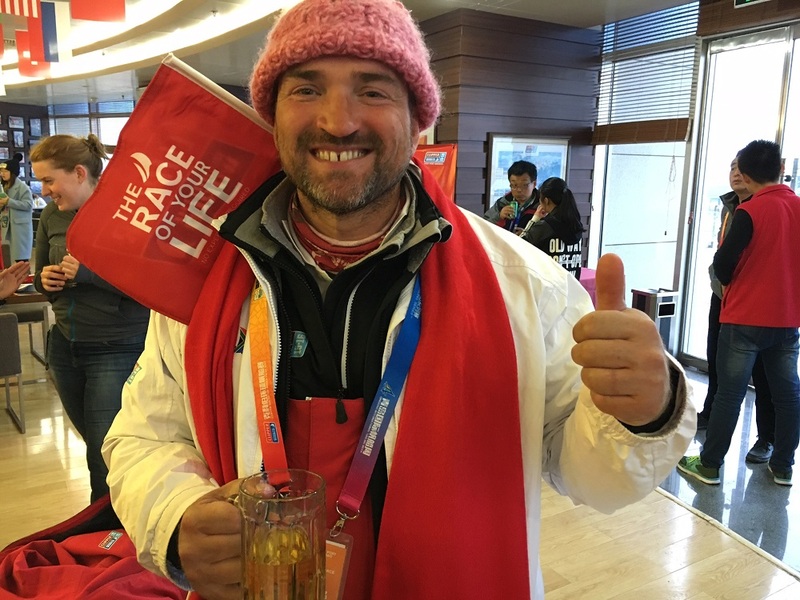 Having made it into port just before sunset, Rob said: "I've never had a birthday like this before and it was the best present ever to get in tonight because my Clipper Race journey ends in Qingdao so there are so many reasons to celebrate. The welcome was so special and the people here clearly love their sailing. I loved the drummers! "I can't believe I'll be back to work in five days, I know where I'd rather be! Now it's all over for me but I've done the best part of 20,000 nautical miles. There have been some highs, some lows, but overall it's been a wonderful experience. Fabulous!"